At Incheon Int’l Airport, Take a Stopover Tour! Many travelers dread the thought of a layover or stopover on their impending trip. Nothing is worse than five or six hours in a place where you have visa-free entrance but don’t want to risk missing your connecting flight. If you have a long layover in Incheon, South Korea, fear not. 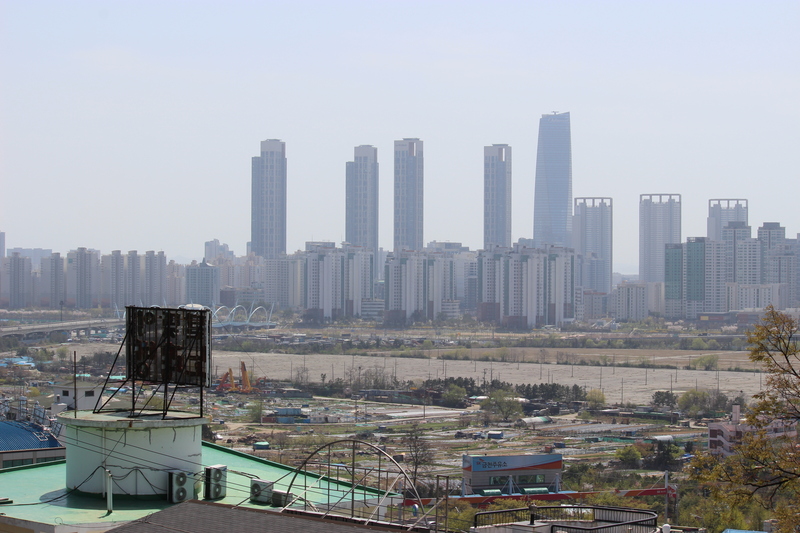 Incheon International Airport offers fantastic– AND FREE– stopover tour options which I highly recommend for a layover as short as even three hours. En route to China in April, my friend and I decided to take the two hour tour option and we had a great time. here is what you can expect on one of these tours. As soon as we got off of our plane and neared the security checkpoint, a woman speaking perfect English asked us if we were planning on staying in Korea or if we had a transit. Once she heard the word “transit”, she pitched the Incheon Airport’s transit tour to us and we happily took the bait. Our tour would be leaving the airport at 1:00PM and returning around 3:00, so we had time to grab some lunch and meet the rest of the group at the front of the terminal. As soon as we passed through security, it was obvious as to why Incheon Airport is constantly ranked as the best or one of the best airports in the world. Dazzling light displays, beautiful open terminal buildings, and FREE showers are just a few of the things you will see past security. 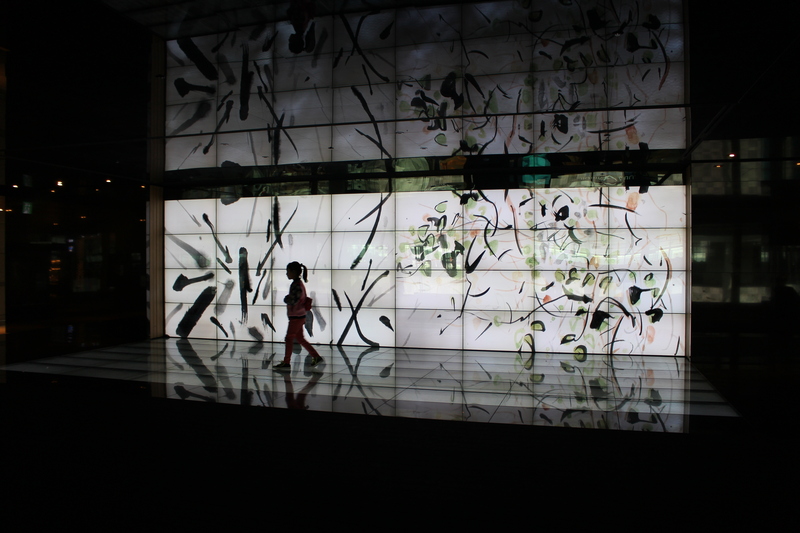 A girl plays in front of one of Incheon International Airport’s interactive light displays. We met our tour guide near one of the airport exits and headed off on our tour with a small group of Americans, Canadians, and Germans. If you have bags, fear not. The tour will store your bags in a secure location while you are in the city, free of charge. 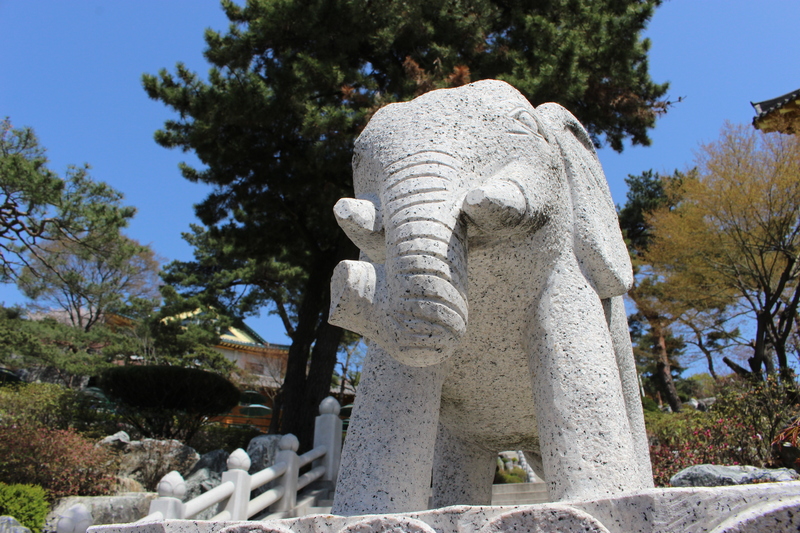 After passing over the bridge connecting Incheon Airport to the rest of the city, we made our way to Heungryunsa Temple, located atop a hill in Incheon. 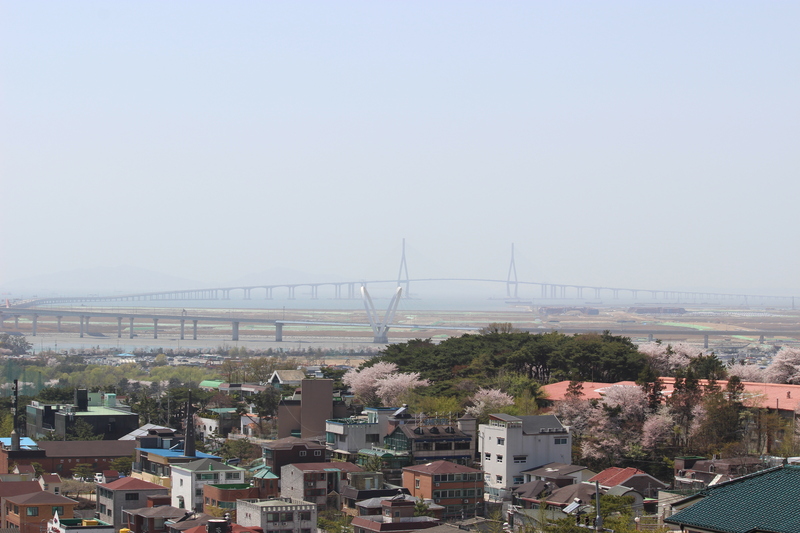 We first noticed the great views of the city skyline and bridge from near where our bus stopped. 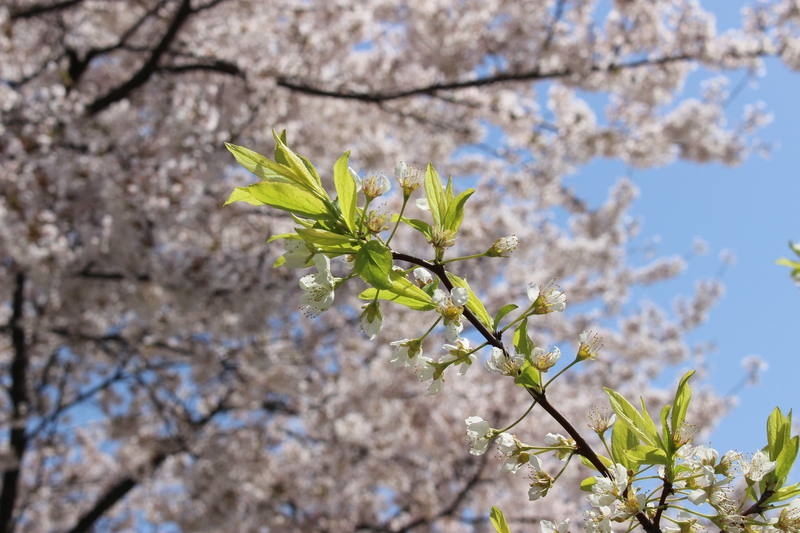 The cherry blossoms near the temple entrance were also in full bloom. 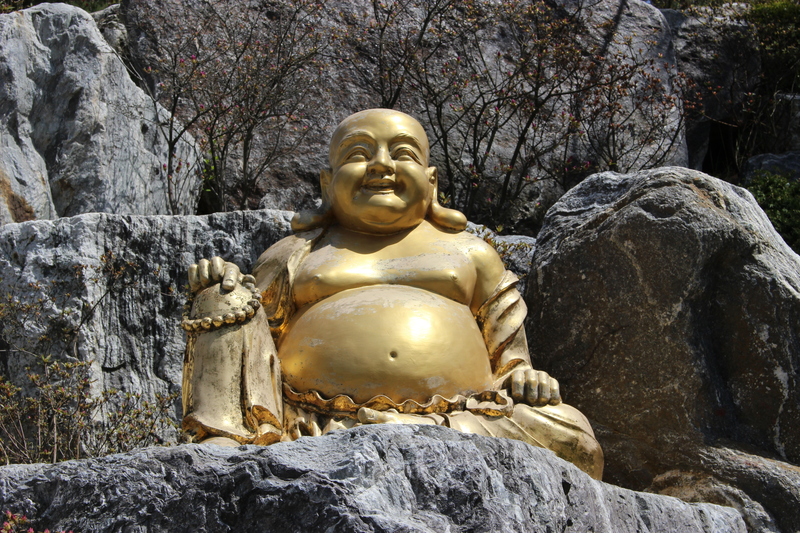 We walked up over 107 steps at this temple which featured some gold-clad Buddhas, nice elephants, and some small gardens. 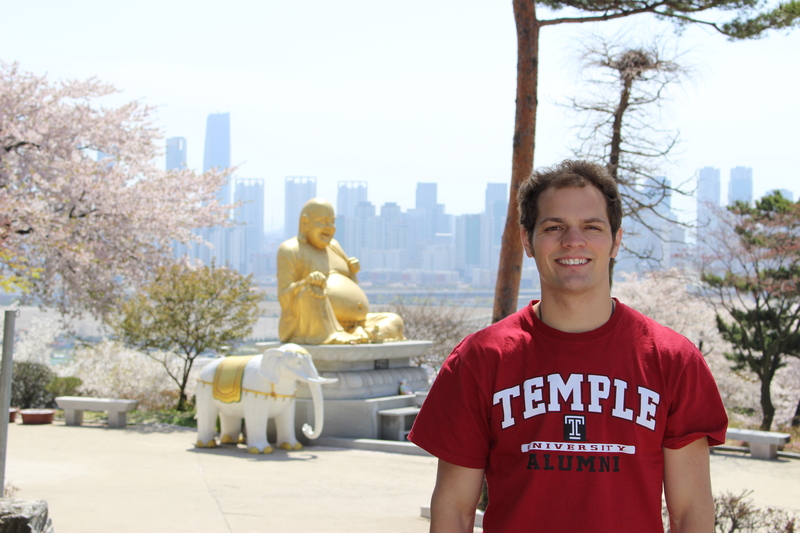 It was nice to get a feel for some of the local Korean Buddhist culture while only being here for such a short time. 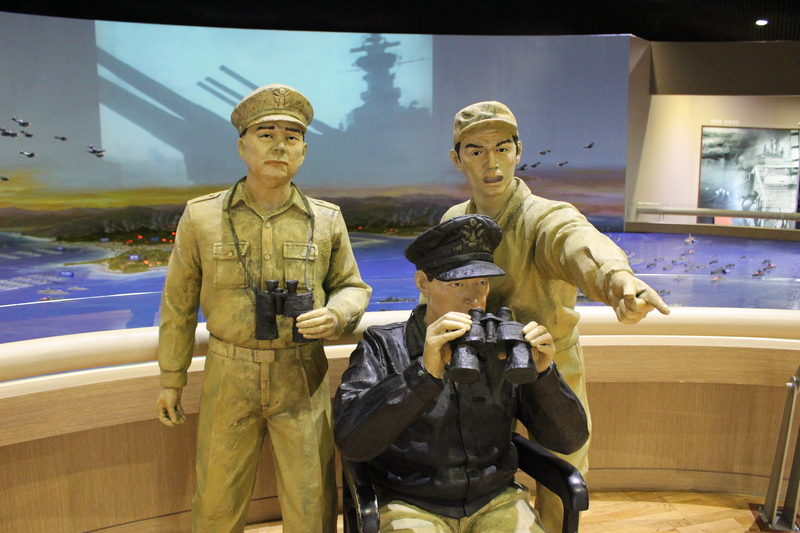 Next stop on the tour was the Memorial Hall for the Incheon Landing Operation. 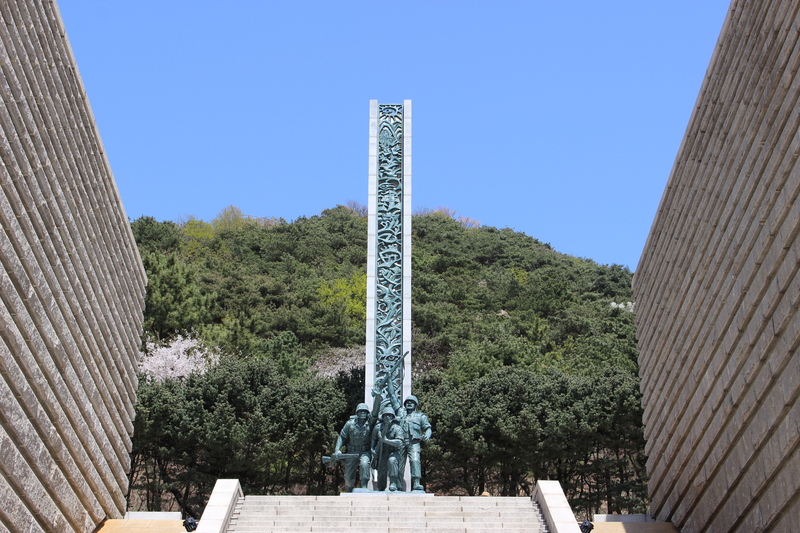 This place was a fantastic location to learn about the Korean War and the immensity of the Battle of Incheon, a daring tactical maneuver and amphibious landing spearheaded by General Douglas MacArthur. The surprise landing and attack was the beginning of the offensive which eventually pressed MacArthur’s troops far into North Korea. 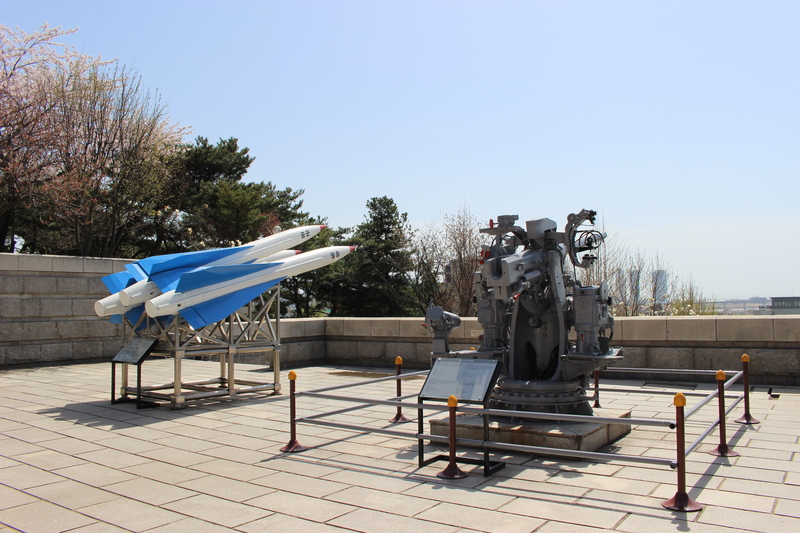 The park features some great period artillery pieces, statues, monuments, and a nice display of flags from the countries which participated in the Korean War. After our brief stop here, we were back to the airport where we thought our tour would finish, but there was one last surprise in store for us. After passing through immigration, we went towards our gate and passed by one of the Korean cultural exhibitions where staff help explain Korean culture and assist you in creating a piece of Korean artwork (again, for free) to take back with you as a way to remember Korea. The two young women working at the store spoke flawless English and we had some great conversations! For about an hour, we talked about travel, Korea, and shared interesting stories about life in Japan and being an expat in Asia. They helped make our experience in Incheon a memorable and unforgettable one. 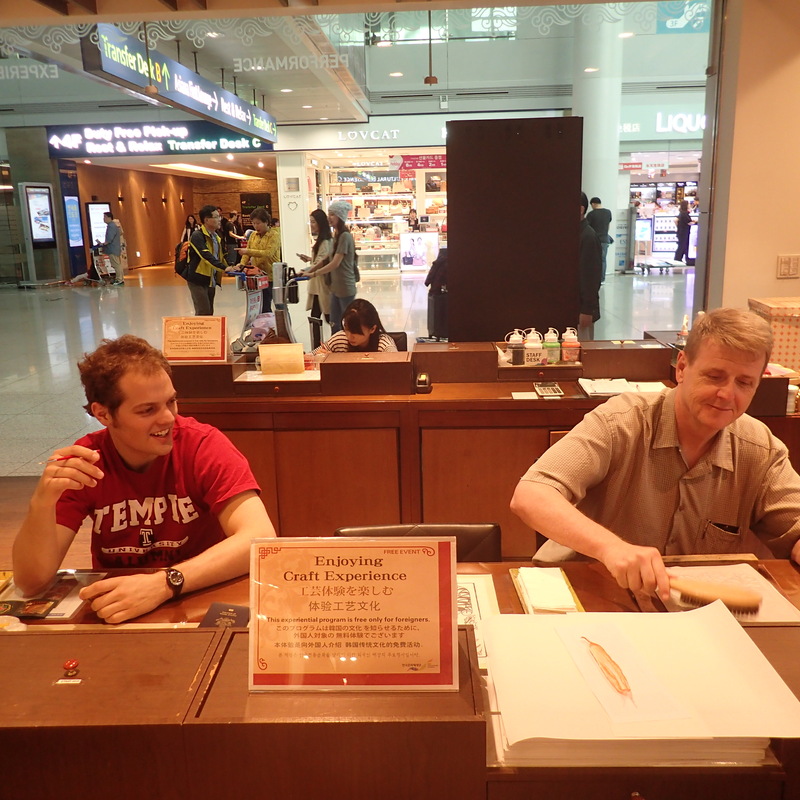 As a matter of fact, they will be my two of my tour guides in Seoul next month with my friends from the United States. To make a long story short, make sure you go on one of Incheon International Airport’s free stopover tours next time you are in South Korea. Also make sure to stop by one of the cultural workshops before you depart. You never know who you will meet. Who knows? 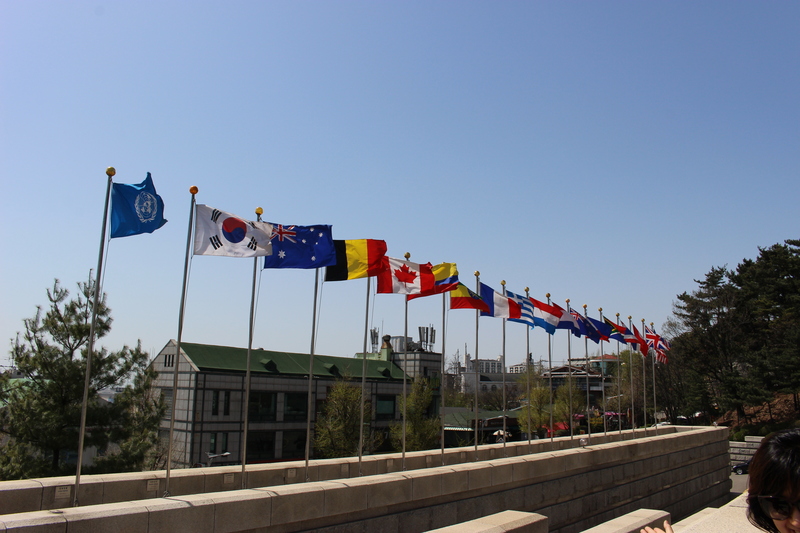 Maybe it will inspire you to go to Korea for longer than a few hours!